This year, a fresh crop of vendors is rising to address the challenge of office noise control in the modern workpsace. While providing separation between employees at the workstation level is important, there are many other areas of the office that can also be acoustically upgraded for better sound absorption. Here are a few of the newest items available for helping businesses keep the noise down. Glass is a lovely architectural component, but it poses special challenges for acoustic control. If the glass is too thin, sound can pass right through, and there’s no confidentiality. If it’s too dense, sound bounces right back into the workspace and reverberates. Unika Vaev is addressing this issue with “Glass Cover”—a 100% wool felt product that can be installed in attractive shapes and patterns to add visual interest and sound absorption to expansive glass walls. SKYFOLD sounds like the name of a James Bond thriller, and the special effects are certainly something to see. This vertically foldable operative wall system accordions down from the ceiling, providing an instant reduction in noise on both sides of the panel. The STC rating is as high as 60, guaranteeing that meetings stay “top secret”. The system is electric rather than manual, for a very hush, hush operation. These motorized panels are available in a wide range of sizes and have even been installed at Texas A&M to divide up lecture rooms to host multiple simultaneous presentations. 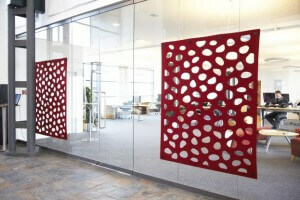 The Modi screen is a new take on the mobile acoustic privacy screen. It features a wood core with acoustic panels of wool felt (that seems to be the textile of the year), and can be provided in a number of different colors. The wheel can be outfitted in a contrasting hue for added whimsy. There’s a handy handle on the side so the screen is easy to tote from one workstation to another. 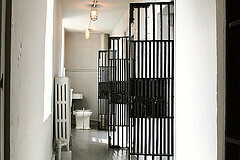 This might even make a nice temporary door for a cubicle. What new tools will you use to bring acoustic balance to your offices this year? Let us know in the comments. Are you going to NeoCon 2014 in Chicago? Registration is still open, and you won’t want to miss the seminars if you’re in town. Here are a few presentations that could make a big difference for employee engagement, satisfaction, productivity, and retention. On Monday, June 9th, Dean Strombon and Sven Govaars from Gensler offer a talk on ‘Happiness by Design: a Capital Idea’. They’ll cover how to measure employee happiness and how to apply these insights to workplace design to improve employee wellbeing. Don’t worry; build happy! One of the reasons so many employees feel stressed is no doubt the shrinking of the work environment. Today, many companies expect the workforce to thrive in less than 100 square feet per person. Kimberly Marks, president of the Marks Design Group, offers her perspective on how to deal with the design limitations inherent in working with small spaces. The seminar is ‘Occupant Load Explosion’ and it’s also on Monday. Acoustics is a topic that’s covered on Monday and Wednesday. SHP Leading Design architect Allison McKenzie discusses ‘Acoustics: The Sound of Sustainable Design.’ She’ll teach you about the difference between Sound Transmission Class (STC) and Noise Reduction Coefficient (NRC). Allison will also talk in detail about how acoustics meshes with LEED prerequisites and credits. Why do 60% of employees say noise makes it difficult for them to perform their work? On Wednesday, Devorie Brown from Commercial Studio of Interior Design discusses the reported statistics about noise in the workplace. She will help participants learn to identify noise sources and create strategies to reduce distractions and create an optimal acoustic environment. Of course, you don’t have to go to NeoCon to get started with a noise reduction plan—we can help you at any time. If you do attend NeoCon 2014, be sure to share your comments about your favorite seminars here. Contract Magazine now has the lineup for this year’s Best of NeoCon (BON) competition live online! As always, it is chock full of brilliant ideas and beautiful designs. We’re paying particular attention to the architectural products category because this is where we get to see products that complement our own. This year, there are quite a few privacy screens of various shapes, dimensions, and materials. It appears that contract furniture designers and manufacturers are coming to the realization that enclosure, noise control and privacy will be key characteristics of the evolving open office space. We’ll be taking a look at one NeoCon showcase product per week for the next month and giving you our opinion. First up are the Connection Zone Screens™ from KI. These freestanding panels have a writable surface, making them function as a giant white board. However, a traditional white board on a movable stand or tripod easel doesn’t serve to really create any privacy for a quick meeting in an open plan office. In contrast, KI says their screens are “mobile marker boards for information capture and impromptu space division”. It’s their attempt to bring actual, practical collaboration to the open office by making it temporarily cozier for small groups. If you get a chance to see these in person at NeoCon, try them out and let us know what you think. NeoCon 2012 was a blast! 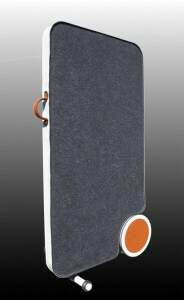 What a great opportunity for networking and a great venue to launch a new product like our desk-mounted privacy panels! Of course, half the fun of being at NeoCon is being exposed to so many fantastic new products and concepts from other manufacturers in the office furniture industry. This year, a lot of companies were really “Thinking Big”. For example, Knoll is seeking to revolutionize how we think about work and how it affects office design. As usual BI Watercooler is on top of reporting this news in concise terms. Check out their blog post for an explanation of the 3 types of workspaces Knoll says can be found in a typical office (focus, shared, and team work) and the 5 types of “activity spaces” that employers should create to support today’s “distributed” work patterns. In simple terms, the old idea of creating separate types of work spaces for different categories of workers doesn’t necessarily make sense when it comes to making the most of your office space. In an average work day, the same employee might need to engage in a wide variety of activities. This means they will require access to a variety of spaces complete with office furniture that supports their current activity. Knoll put together a “virtual” showroom so those of you who didn’t make it to NeoCon can still view this concept in action. You can see in their blueprint how “Refuge” spaces for heads down work are co-located with “Enclave” spaces for casual collaboration among small groups. That approach makes a lot more sense to us than the trend toward making an office totally open plan with no panels or dividers. That kind of setup supports only the collaborative idea of work and doesn’t reserve any space for work that requires solitude and concentration. We definitely see our OBEX products meshing with this new vision for creating a blended workspace that supports a broad range of activities. Our panels are easy to add to any cubicle or desk to instantly create a “refuge” space for focused work.